The owners of several privately-owned radio stations are calling on Prime Minister Moses Nagamootoo to postpone debate and expected passage of amendments to the Broadcasting Act and first meet with them to discuss their concerns. “Having been made aware that the Bill could be passed before the end of the week, the group is urging that it be deferred until meaningful consultations can be held,” the group said in a statement following a meeting on Monday when the Broadcast (Amendment) Bill 2017 was discussed. The station proprietors and operators said they have numerous concerns about the proposed licensing fee structure and the apparent move by government to demand one hour per day for “public service” programmes. “The primary concerns were the negative impact it could have on sustainability of operations with regard to the licensing fee structure, the imposition on property and the infringement on the freedom to determine broadcast content,” the grouping said in a joint statement. The radio and television broadcasters said they would be formally requesting a meeting with the Prime Minister “so their related concerns can be made known.” The owners said given the wide-ranging implications of changes to the law, they are demanding that the Prime Minister meets with them. “The group, having not been consulted to date or during the preparation of the Bill, is hoping that the authorities would afford the opportunity now before this important piece of legislation is passed. It believes that the impact on freedom, livelihood and jobs compels the decency of having consultations with the allowance for inputs. Already, the radio and television broadcasters are worried that the proposed amendments would violate their constitutional rights and so they need clarification on that point. FILE PHOTO: Television broadcasters at a recent meeting with Minister of Public Telecommunications, Cathy Hughes and other frequency and broadcasting regulators on the planned conversion from analogue to digital transmission systems. 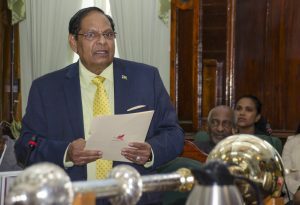 “It is hoping that in the interest of democracy and freedom of expression, the authorities would understand the magnitude of the impact the Bill in its current form could have on the future of television and radio broadcasting in Guyana. As such, the desire is for a Bill that can be reached through consensus,” the operators said. If government uses its one-seat majority in the 65-seat National Assembly to pass the amendments and President David Granger signs it into law soonest, it would mean that all radio and television stations would have to apply for licences within 30 days. If any of those stations- all of which have been operating without a license for several years- are not granted new licences, the amended law states they will have to cease operations and if they do not comply they will be fined and their equipment seized. Also of apparent concern to the private radio and television stations are amendments to the Broadcasting Act having to do with zoning and licensing fees. The lone primary zone stretches across much of the coast from the Essequibo River to the Abary River, while the secondary zones are all of Region One, all of Region Two and the Essequibo Islands; all of Bartica; all of Region Six including New Amsterdam and part of Region Five west of New Amsterdam to the Abary River and all of Region 10 including Linden and the section of the Berbice River which falls within Region 10. The tertiary zones are all of Region Nine, all of Region Eight and all of Region Seven excluding Bartica. 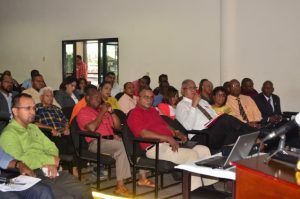 A community class broadcasting service may be provided within any of the broadcasting zones, except the primary zone, with a transmission radius of not more than five miles or such other transmission distance as is specified in the broadcasting licence issued by the Guyana National Broadcasting Authority.